More details emerged Monday on Mortenson's luxury residential tower, which will be built at Fourth St. S. and Marquette Av. in downtown Minneapolis by Golden Valley-based Mortenson. Last week, we reported that an LLC called 400 Marquette Property Owner purchased the site for $4.1 million. The LLC is actually an entity associated with New York-based American International Group (AIG), which is participating as a capital partner and owner of the project. A pricetag for the project has not been revealed. 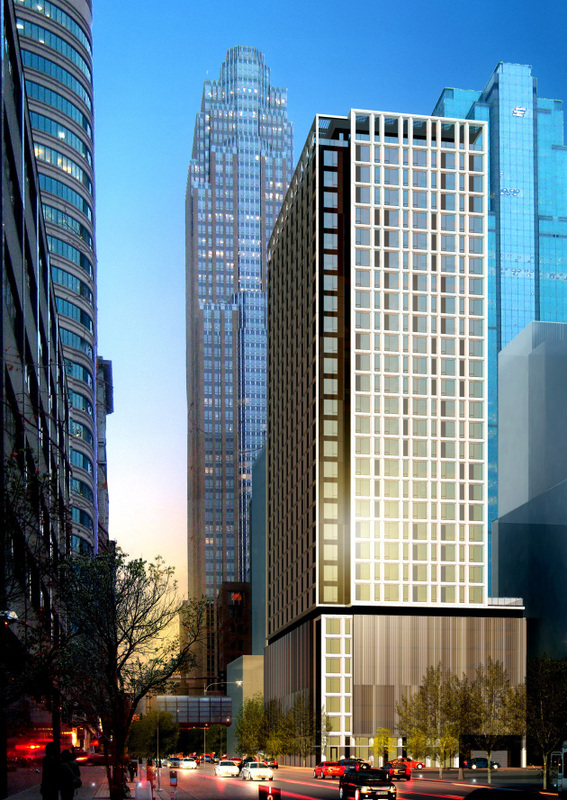 Called 4Marq, the tower will span 30 stories and feature 262 luxury units. It is expected to be completed by first quarter of 2016. The project's address is 400 Marquette Av. S.
The tower will include studio, one-, two- and three-bedroom units, with on-site parking in an above-ground ramp. Amenities include pet-washing stations and dog run; a commercial-size laundry for larger units, as well as in-unit laundries; concierge, lounge space and commercial space; proximity to the Nicollet Avenue light-rail station; penthouse-level space with a party room, media room, yoga studio, business center, outdoor fireplace, gas grills, indoor and outdoor lounge areas. "Minneapolis is undertaking transformative redevelopment on many levels," said Bob Solfelt, vice president and general manager at Mortenson Development, in a statement. "The 4Marq project aligns with the MInneapolis Downtown Council's 2025 Plan. Expanding the residential population of downtown to 70,000 has to start block by block, and we're excited to do our part by helping to develop a neighborhood around Nicollet Avenue Station." Said John Lippmann, who manages New York Life Real Estate Investors' national construction and bridge-lending platform: "We are excited to work with such well-established sponsors on this project, which allowed us to pair our technical expertise and market knowledge to provide a well-structured, long-term loan." The remaining portion of the block will also be home to the $100 million 253-unit Nic on Fifth apartment tower, which will open later this summer, as well as an expansion of Xcel Energy's Nicollet Mall headquarters. These two projects are being developed by Minnetonka-based Opus Group.